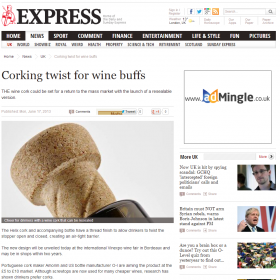 THE wine cork could be set for a return to the mass market with the launch of a resealable version. The Helix cork and accompanying bottle have a thread finish to allow drinkers to twist the stopper open and closed, creating an air-tight barrier. The new design will be unveiled today at the international Vinexpo wine fair in Bordeaux and may be in shops within two years. Portuguese cork maker Amorim and US bottle manufacturer O-I are aiming the product at the £5 to £10 market. Although screwtops are now used for many cheaper wines, research has shown drinkers prefer corks.